The Mains Examination of RBI Assistant will be here in a short span and we have only a month left for the IBPS Clerk Prelims Exam. As far as RBI Assistant the cutoff marks for the same is very high as the exams were in the easier range. The result of the much expected IBPS CLERK PRELIMS EXAM 2017 will be out in the forthcoming days, so the preparations for the IBPS Clerk Mains which happens on 21st January, 2018. So the preparation is vital to crack the IBPS and the RBI Assistant Mains Exam. 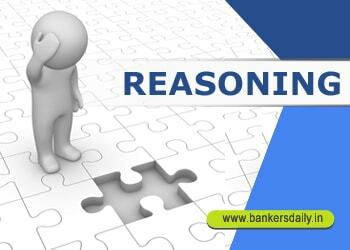 Reasoning as always will be the easiest way to score more in the exams, so this section cannot be listed as such. So prepare with difficult questions during the preparation because if by chance the exam was in the tougher category then your preparation will help you to ace the exams in a great way. Solve these questions and make your preparations in the right way. This time we are providing Sequential Output tracing questions which may be asked in the IBPS Clerk Prelims and RBI Assistant Mains Exam 2017. Study the following information to answer the given questions. A word/number arrangement machine when given an input line of words and numbers rearranges them following a particular rule. The following is an illustration of input and rearrangement. Q.1) Which of the following would be the step IV? Q.2) Which of the following represents the position of ‘apple’ in step IV? Q.3) Which word would be at fifth position from the right end in step II? Q.4) Which word would be third to the left of second element from the right end in the step III? Q.5) How many words are there between ‘pen’ and ‘urge’ in Step V? Q.6) Which of the following represents the position of ‘sky’ in step IV? Q.7) Which word would be at eighth position from the right end in step II? Q.8) How many elements (words and numbers) are there between ‘sky’ and ‘66’ in the fourth step of the given input? Q.9) Which word would be third to the left of fourth element from the right end in the step V? Q.10) What is the difference between the number which is second from the right end in step II and the number which is sixth from the right end in step IV? You can check the answers for the above Sequential Output Tracing from the ones that are provided below. Number arrangements => sum of two digits arranged from ascending order. You can also check the questions on Sequential Output Tracing from the one that is given below.